Adding a decorative understory contrast to our stately tall conifers are the native vine maples. 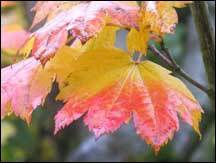 While vine maples can be single trunked, they more typically are multi-stemmed large shrubs with the telltale maple leaves and elegant tiered branching like that of Japanese maples. 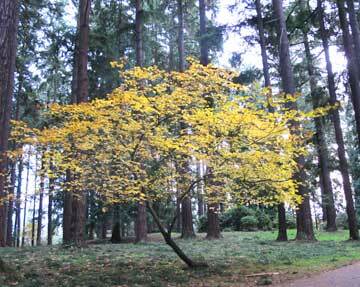 In the fall, the vine maple leaves provides a soft yellow glow in the dappled light beneath the towering conifers. In sunnier settings, the autumn leaves change to hues of orange to red. Flowers of wine-red and white form along the branches in the spring. These contrast with the red sheaths covering the yet-to-emerge leaves and the reddish new woody growth. 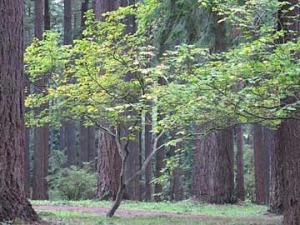 Although vine maples rarely grow taller than 20 feet, their branches have a lovely way of reaching and arching in a vining fashion, giving it a wide spread of up to 20 feet. Vine maples are also great wildlife plants. Its seeds nourish songbirds, squirrels, & chipmunks. . 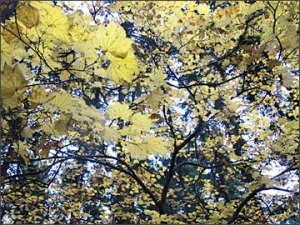 Deer and elk also feed on its foliage and twigs. 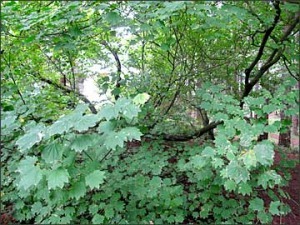 In addition, the vine maple’s tough flexible wood was used by many Northwestern tribes for tools, bows, drum frames and baskets, among other uses.